Safeway Monopoly 2019 (With Rare Pieces): It’s time to shop, play, and win the Safeway Monopoly 2019 at at www.shopplaywin.com and in over 2,000 participating locations operating under the names of Albertsons, Safeway, Pavilions, CARRS, VONS, Randalls, Eagle, Pak ‘n Save, Tom Thumb, Jewel-Osco, ACME Markets, Shaw’s/Star Market, United Supermarkets, Market Street, Amigos, United Express, Albertsons Market, Lucky (Southern California only) and Super Saver. 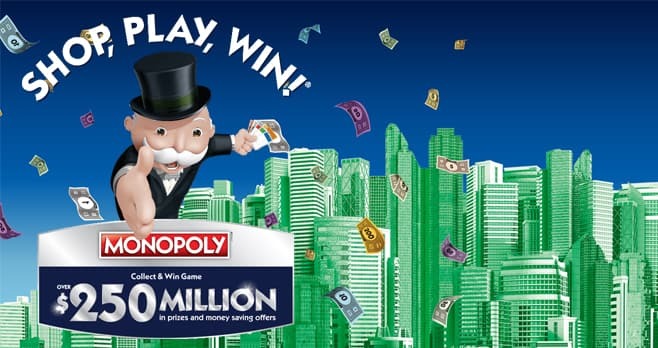 This year, find the Safeway Monopoly 2019 rare pieces, fill your Monopoly game board and play online at www.shopplaywin.com for your chance to win over $250 million in prizes and money saving offers. Plus, scan your codes with the new Safeway Shop Play Win Monopoly app (available on the App Store and the Play Store) for more prizes, sweepstakes entries and to track the Safeway Monopoly rare pieces 2019. The rare Safeway Monopoly pieces 2019 are as follows: 335CI, 336DI, 341CJ, 343EJ, 394BW, 397EW, 398AX, 401DX, 403AY, 404BY, 408AZ, 411DZ, 416D$, 417E$, 419B#, 420C#, 302BA, 308DB, 309AC, 315CD, 318BE, 321AF, 327CG, 332DH, 391CV, 388DU, 381AT, 379CS, 374BR, 372DQ, 365AP, 362BO, 358BN, 353AM, 351CL, 348DK. For more details, please refer to the rare pieces chart below. When Does Safeway Monopoly End? The Monopoly Game ends on May 7, 2019 or when all game tickets have been distributed. What Is The Sweepstakes Prize? The Grand Prize consists of $1,000,000 Cash. Who Are The Monopoly Safeway Winners? The names (first name and last initial) and city and state of the prize winners with $600 value or greater may be obtained at the conclusion of the Promotion by sending a first class stamped, self-addressed envelope to: SHOP, PLAY, WIN! MON-12 Game Winners, P. O. Box 813368, Smyrna, GA 30081. Requests must be received by September 29, 2019. I have 403AY. If you have 404BY let’s make a deal. I will sell mine or buy yours. I HAVE 335CI, ONE OF TWO RARE SAFEWAY MONOPOLY PIECES FOR THE $1 MILLION PRIZE.. DO YOU HAVE 336DI??? WOULD BE HAPPY TO SPLIT THE PRIZE IF YOU ARE LOOKING FOR 335CI. LETS PUT THE TWO HALVES TOGETHER AND COLLECT THIS PRIZE!!!! CONNECT ON EMAIL, PLEASE. I have 408AZ for the $20,000 College Tuition. If anyone has the 411DZ I’ll split with you. I have this time acculated 4 shopplaywin tickets that fail to respond on the site, I’ve checked the number/letter combo and they are correct. Is this a scam or a REAL error, and how do I report it, I can scan these tickets in to PROVE they are suppose to be Legit !!!! Was so excited as I won the $200 Family Picnic! It was right before my birthday and then a couple days after I won a $10 Safeway gift card! I have 343EJ Vacation Home anyone interested ? Karen Peterson with I need 335ci.. I have all the others in the series. not sure how to contact you. no link to your email. happy to split if its legit. If I have 71 tokens, how come I can only spend 45. Also- What is Shutterfly. How do I enter those codes. Like many other people, I have not been able to get on the site or log in to input my tickets. It just keeps looping. TO: EVIND BRENDTRO. SEND ME YOU EMAIL VIA MINE AS ABOVE. WILL SEND YOU A PICTURE IF GAME BOARD..
WHERE ARE YOU LOCATED? WE CAN WORK THIS OUT IF IT MEANS SPLITTING THE PRIZE. AM EXCITED HOPE WE WILL HAVE ENOUJGH TIME TO GET IT DONE. WE ARE CLOSE TO THE END OF CONTEST. I cannot enter my codes. I go to shopplaywin com and I get to the site. I don’t know what to do to enter my bar codes. Please help. I have 4 of the 5 for the $7500 family vacation. I just need 420C# and am willing to split the prize. Please contact me via email. Thanks. For those of you who can’t enter codes, have you tried using a different browser? what happen don’t work of computer at prize at code??????????? I have 335CI and also 219B. Happy to split if you have the missing piece. Happy Playing! Oops! I entered the wrong number for the family vacation. I have #419B. Sorry for the error on my part. Still wishing us all Happy Playing!